Classes are taught on the 160 acre mountain top campus of StoneWind Institute and StoneWind Retreat at Chester, Arkansas midway between Ft. Smith and Fayetteville in the beautiful Boston Mountains. StoneWind is within easy driving distance of Texas, Tennessee, Missouri, Oklahoma, and of course Arkansas via I-40. The closest airports are at Ft. Smith-FSM (30 min.) and Bentonville-XNA (1.5 hrs). 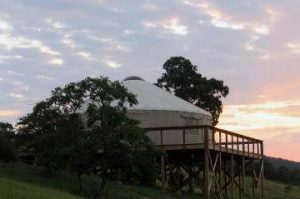 Classes are offered on a regular basis in the East Room teaching facilities, with students able to stay in the elegant yurt accommodations of StoneWind Retreat or in some of the nearby accommodations listed below. Those who are simply looking for a healing rest or extended healing intensive can enjoy the comforts of StoneWind’s yurt cabins through StoneWind Retreat, which is open to Guests year round. For rates on extended stays for Institute guests wishing to work on their healing issues, please call 479-369-4959. The East Room is open evenings and between classes as a quiet place to meditate, while each of the Yurt Cabins is designed for optimum peace and quiet for meditation and study. There are lending libraries in the Office with books, magazines, DVD’s and CD’s on a range of topics related to holistic healing, metaphysical topics, and entertainment. Reiki and Qigong classes are held in the 1600sf East Room located in StoneWind’s Red Barn office building.